We are aware of the many stone circles in Britain alone, let alone all the others scattered about the world. In light of that, the huge number of gratuitous references to Stonehenge (“the Stonehenge of the North,” “the Stonehenge of South America,” etc.) and gratuitous pictures of Stonehenge throughout our culture when any of the many beautiful stone circles would serve, began to seem funny to us. When we came upon an unexpected Stonehenge picture on TV or in a magazine, we would quietly say “Score!” and mark up an imaginary point. Encouraged by an internet acquaintance of like mind, we began to search online for Stonehenge references and replicas. It was casual at first–just for laughs–a butter henge here, some biscuit henges there, and of course the well known ones like car henge and fridge henge and the modern stone “henges” scattered about the States. But after a bit the sheer number of ersatz henges [we use the word henge here, not in the true sense of a circular earthwork mound with a ditch, but in the sense that it is commonly if mistakenly understood, as a stone circle, often with lintels over some pairs of stones] filled us with a kind of horror-filled joy, and we decided something must be done. Clonehenge is that something. It is a celebration of those first builders who erected Stonehenge as we understand it today, whose idea has turned out to be the ancestor of all icons, so powerful in image that five thousand years later people feel compelled to emulate their achievement, often in the most unlikely places and unsuitable media. It is also a celebration of the ingenuity and mad genius of those people today who decide, usually for no reason except fun and the challenge, to make Stonehenges out of anything they can lay their hands on. Hurray for the builders! If you have Stonehenge replica photos that you would like to see posted on this blog, we would love to see them. Send any communications to nancy.wisser at gmail.com, eliminating the spaces and using the @ sign. P.S. : About the scoring–we know that Druids had nothing to do with the building of Stonehenge and similar sites, that when they arrived Stonehenge was already thousands of years old, but perhaps because of that, and because of how the perception of druid connection with Stonehenge doggedly persists, druids seemed like a good unit to use for scoring. The scoring is pretty arbitrary and really just for fun. Ten druids, by the way, is a perfect score. Only Stonehenge itself could score a ten, but sadly it does not qualify, not being a Stonehenge replica. Main blog editor, Nancy Wisser, aka aluta or Geophile, also does the Geopsych Tumblr, which is otherwise completely unrelated to Clonehenge (if anything indeed is, which we have begun to question). 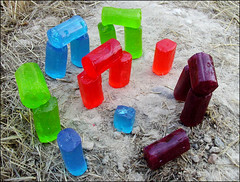 Facebook group for the Clonehenge blog can be found at: Clonehenge, Stonehenge replicas unleashed! Love it! Thanks for sharing with us! Posted it to show it to our Facebook group. Yes, I probably should have mentioned that Stonehenge is now on Google Street View. Worth a look. Thank you, Ann. I will certainly post that sometime soon! Thank you. I certainly will call! Call Nancy Pantoni at 610-433-0676 and she’ll tell you about the tunnels in Nazareth. She lived on S. Main Street and in the basement of her father’s barber shop was an entrance to the tunnel. She would like to tell you about this.